Congress’s role in governing our republic includes the responsibility to create necessary and proper laws within the authoritative boundaries of constitutional powers. But the current process by which a bill becomes a law desecrates the Founder’s ideals. 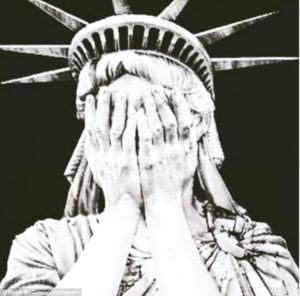 The “institutional defenses” built into the constitution have been eroded by the malicious use of deception and disregard for ethical principles. “Laws begin as ideas” so they can come from any of us, ideally. But in today’s reality, it’s more likely a special interest group will solicit one of our representatives to move their proposal into law. Enter (in this case) the technology industry — through the Data Summit and the Data Quality Campaign that was launched in 2005. 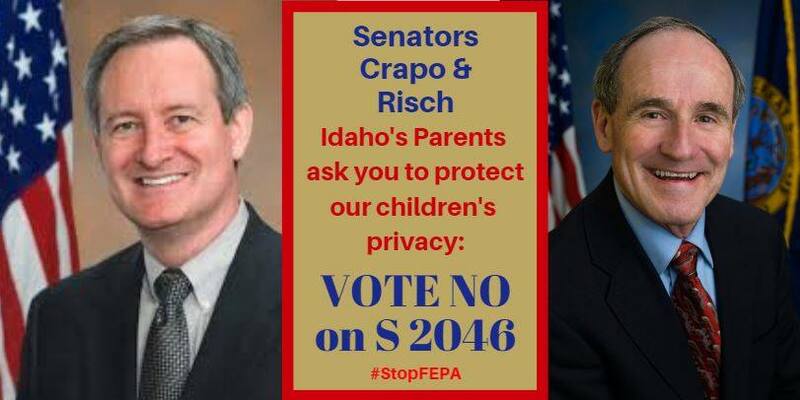 With the Great Recession holding the country’s attention, both the Bush and Obama administrations loosened a major privacy law allowing expansion of data collection and its use in “research” on a Human Capital Development Data System. Acceptance of federal stimulus funding from the American Recovery and Reinvestment Act (ARRA, Recovery Act) served as an incentive for completion of the project to collect, share, and link student data between agencies and across states. 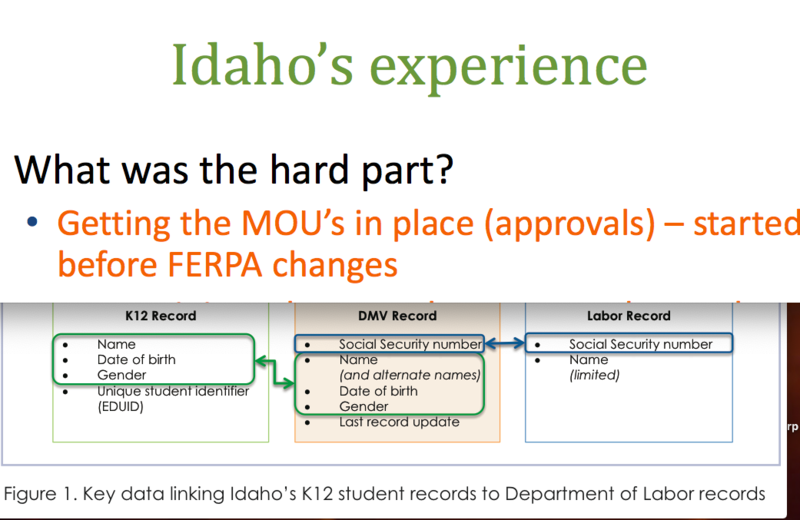 FERPA has yet to be changed back to requiring parental notification and consent to share student data. One strategy used to put these data collection systems in place was to NOT have open discussions or public debates. 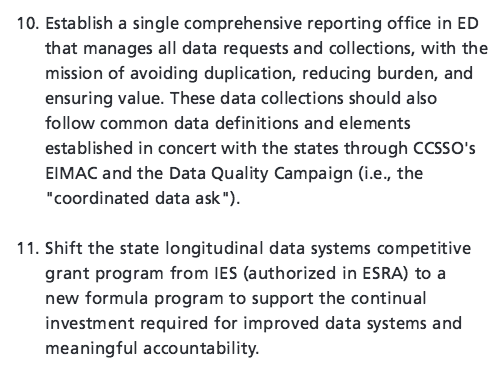 State Longitudinal Data Systems Best Practices included “EFFECTIVE” Communications. 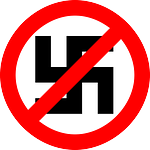 In this case that means NOT allowing “open forums.” It means communicating the right message. The “do not engage” practice moved the project along at the state level. Next up was federal legislation, which requires the kind of broad support that only money can buy these days. The messaging needed to be just right. The “best practice” of not exposing an idea to too many people, or too much scrutiny, was taken to the next level — to both houses of congress with both political parties involved. The adoption of a federal data consolidation bill began by asking for a commission to study the idea. It was approved by a Voice Vote. They were only asking for a study to be done. … No big deal. A Voice Vote means there is no record of individual votes. D.C. Think Tanks and other organizations rejoiced! The public remained uninformed. 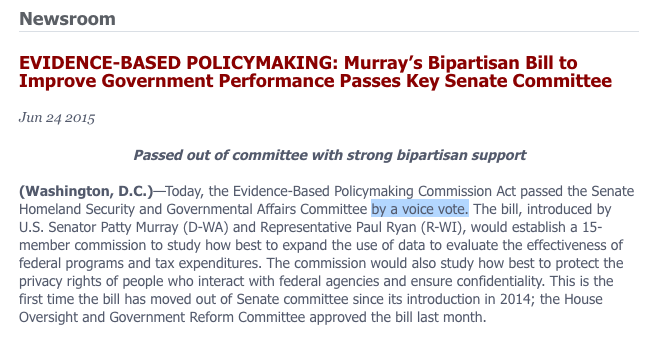 It didn’t take long for the Foundations for Evidence-Based Policymaking bill to emerge. Note: Senator Patty Murray mentioned “federal agencies” — plural. This is no small deal. This is huge! The U.S. House of Representatives passed the bill under suspension of rules —by Voice Vote! That was on November 15, 2017 —2017 pre-holidays —and Twitter lit-up in protest. Throughout the holiday season education activists watched for movement of the bill in the Senate. Pre-Christmas had become a favored time for education bills to quickly become law. This time nothing happened. Had it died in committee? NOPE! DECEMBER 19, 2018….2018.…real close to Christmas….and it passed by Unanimous Consent — the Senate’s version of a Voice Vote (no roll call, no individual record). December 20, 2018 —Back to the House. DECEMBER 21 —the Friday before Christmas with a Lame Duck Congress at 4:14 PM—the House did a roll call vote TO SUSPEND THE RULES. The bill known as HR4174 (FEPA – Foundations for Evidence-Based Policymaking) officially passed both houses of congress. But the story doesn’t end. Congress recessed. The bill did not go immediately to the president’s desk. If it had and he did not sign it within 10 days, this bill would have been killed by what is called a “pocket veto.” But if Congress is in session and the president does not sign the bill within 10 (working?) days, it becomes law. JANUARY 2, 2019 —FEPA HR4174 (sister to Washington Sen. Murray’s S.2046) went to the president’s desk. Today is January 14th. My senators are not answering their phones at 4:14 PM. Nor is the Senate Homeland Security & Governmental Affairs Committee (the one that slipped this bill out of committee a year after activist had eyes on it). We might expect some bad behavior from the liars in the House, but Senators should act with more integrity. So, WHAT’S In The BILL? Better question: What is not in the bill? The public is being told that the recommendations made by the FEPA Commission were followed. They were not. Data privacy recommendations were ignored. Here is what the public should have heard debated. It is a sad day for the republic. When it comes to Open Government, the Sunlight Foundation asked this about a Trump White House. If Congress is the ultimate watchdog, the republic is in deep trouble. Education reform leaders like Bill Gates have disrupted our public schools without considering how their plans disturb the education of children and upset the lives of families. Repeatedly, political and philanthropic leaders force change on our schools without any meaningful open exchange of ideas with parents and educators. They are in control of education policy. Education policy controls how our public dollars are spent. How our money is spent does matter. Policy — coming down from above — matters. The education reform oligarchs driving their agenda into our laws are the ones ultimately governing our schools. So it behooves us to look closer at Mr. Bill Gates’ perspective. From what Mr. Gates said, he sees the philanthropic role as being “to shake things up” and fund pilot programs. He says he sees philanthropy as having a “super-narrow role” because the reality is that the public is footing most of the costs. But what Gates sees as a primary role for philanthropists I saw, beginning in the mid to late 90’s, as a primary problem. No one had clarified the concept of what exactly a “pilot program” meant. The people piloting failed programs didn’t send in cleanup crews. There were no “Super Fund Site” signs going up at my neighborhood schools. But if a person thinks that little learning is actually going on in schools before they step in, they might consider any harm done as insignificant. That may be the case with Mr. Gates. Wow! Really!?! And I thought that educated mothers around the world wanted their children to get a good education. I believe that is the major reason parents send children to school. So how do we view the school improvement problem? 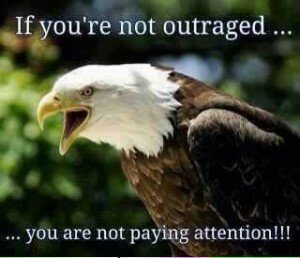 What I believe can’t be so simply stated. I believe in “the political principle” as an ideal that politics has failed at miserably. And time and again, politics has proven itself to be an irresponsible driver of educational progress. 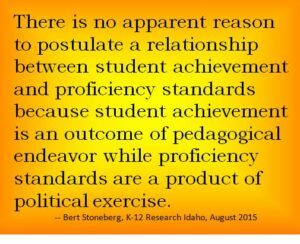 That quote is based on statistical analysis of the rigor of standards and their lack of correlation to student achievement. For decades, the faith in setting standards as a reform is what politicians and much of the nation agreed to spend education reform dollars on — “ever – higher” standards and the tests to determine achievement outcomes. On this topic, I believe in the historical evidence uncovered through my own research and the facts provided by people a whole lot smarter than I. But ignoring all that, federal and state policies cemented the idea that standards are the necessary first step in education reform without considering the historical and statistical evidence demonstrating that the standards/outcome-based theory is incorrect. So when did Bill Gates jump into the education reform arena? Exactly? Well, that’s hard to pin down but what is important to know is that by 2006, Mr. Gates had become the most influential person in education reform policy in America. What probably matters more is who influenced the influencer? 1990 Tucker’s NCEE publication “America’s Choice” continued the push for benchmarked standards in order for the U.S.A. to remain competitive in the global economy. Marc Tucker clearly urged leaders to focus on output measures at the Task Force on Education Workshop chaired by then Governor Bill Clinton (Tucker minute 33:30). With political figures including Bill and Hillary Clinton on board with the Outcome-Based Education Reform Movement and then Secretary of Education Lamar Alexander cheering the first federal funding earmarked for World Class Standards/Academic Achievement Tests (p93), the federal role in education expanded. 1996 The Education Summit brought together governors and business with education and community leaders. Their mission: To start a national effort to establish high academic standards, assessments, accountability and improve the use of school technology as a tool to reach high standards. 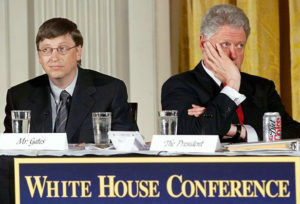 As the story goes, this meeting gave birth to Achieve, Inc.
1999 Gates co-founds the Bill and Melinda Gates Foundation. Among many other things, they provided funding for Achieve, Inc. The Gates Foundation became a continuing financial supporter of Marc Tucker’s projects at NCEE. 2001 — President George W. Bush signed No Child Left Behind into law. 2005 Bill Gates co-chaired the National Education Summit on High Schools. Gates emphasized — there is crisis— our schools are obsolete—and a new design is required. The Gates agenda is an intellectual cousin of the Bush Administration’s 2002 No Child Left Behind law. 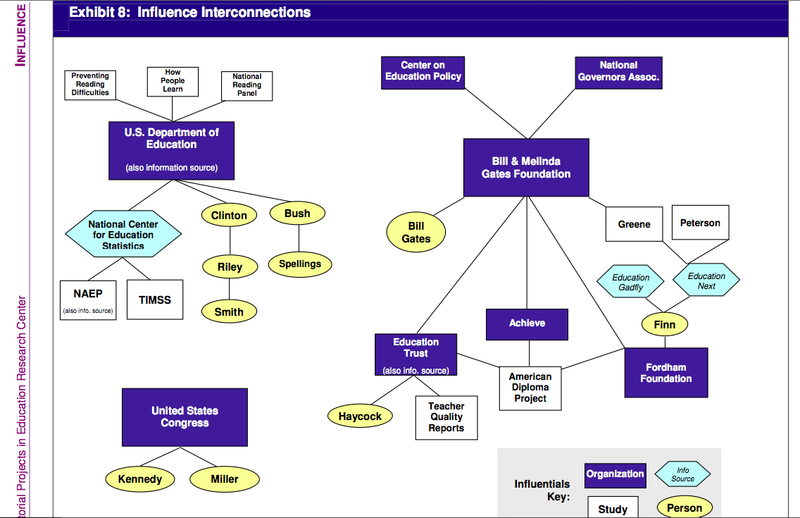 In 2006, with Bill Gates viewed as more influential in education policy that President Bush, the only two government institutions on equal footing with the Gates Foundation were the U.S. Department of Education and Congress…..NOW? Some players have changed. Who governs is the question. For Gates to amplify his philanthropic influence, all he needed to do was gain control of Congress and the U.S. Department of Education. … With Marc Tucker as one collaborator, education leaders were trained and placed in the U.S. and many State Departments of Education. Influencing Congress? It only requires the multiplication of think tanks, organizations and their lobbying efforts. Now, if you look back at the video clip at the top of this blog (minute 3:18), Mr. Gates chuckles about philanthropy being “so big we could take” over. 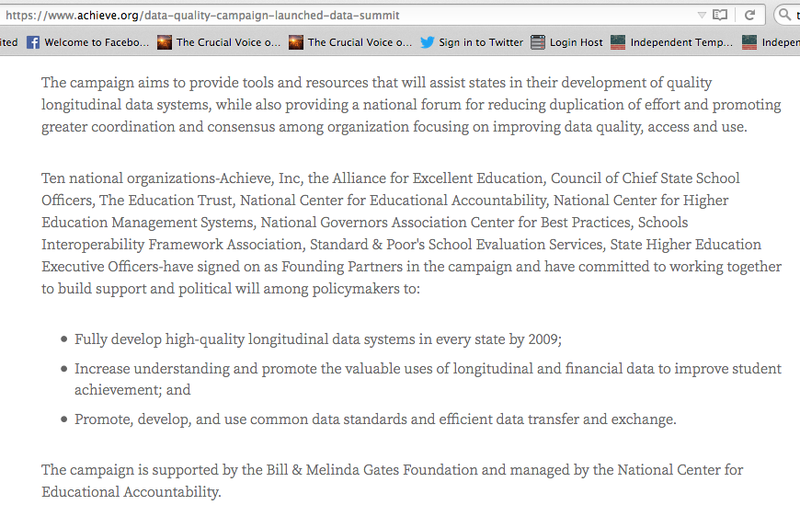 2006 The Data Quality Campaign Launched at the Data Summit — supported by the Bill & Melinda Gates Foundation. The campaign promoted their “ten essential elements” of a longitudinal data system, which included the ability to match student records between the Pre-K and post-secondary systems. You be the judge. The following screen shots come directly from documents about data collection and sharing pilot programs put in place simultaneously with Common Core Standards. The years between 2009 and 2014, the Common Core years, created murky waters in the swamp. 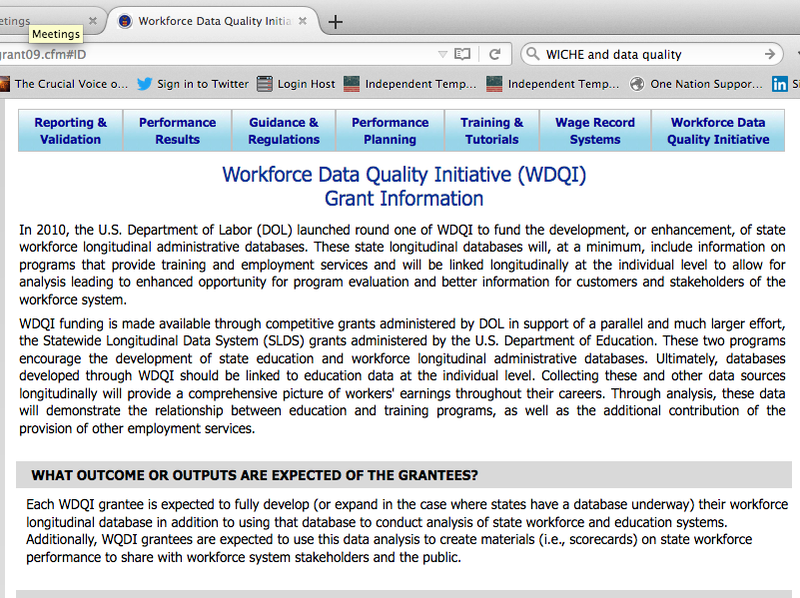 Exactly when and how the Workforce Data Quality Initiative (WDQI) arose is probably a story for another time. What is important to know is that real concerns exist for all citizens, particularly for parents wanting to protect their children’s data. Is the Department of Education addressing parent concerns? How about Congress? 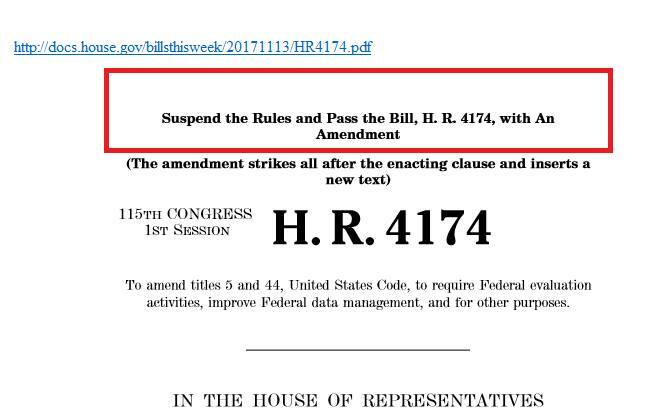 The bill before Congress known as the “Foundations for Evidence-Based Policymaking” (FEPA, H.R.4174) was pushed through the House without debate. The foundation it puts in place is a mega federal database without mention of education data — but that is the plan. Next up will be the College Transparency Act (CTA) which overturns the ban on a federal student record system. This is the Gates agenda. But go back and read the Dear Hillary Letter. This is the Marc Tucker plan. Is this America’s choice? To date, leaders have brushed citizen concerns aside and done what they want. That leaves me wondering; is it too late to regain control of schools through civil disobedience? Will that work against an oligarchy? One thing is certain; our representatives are driving policy while under the influence. 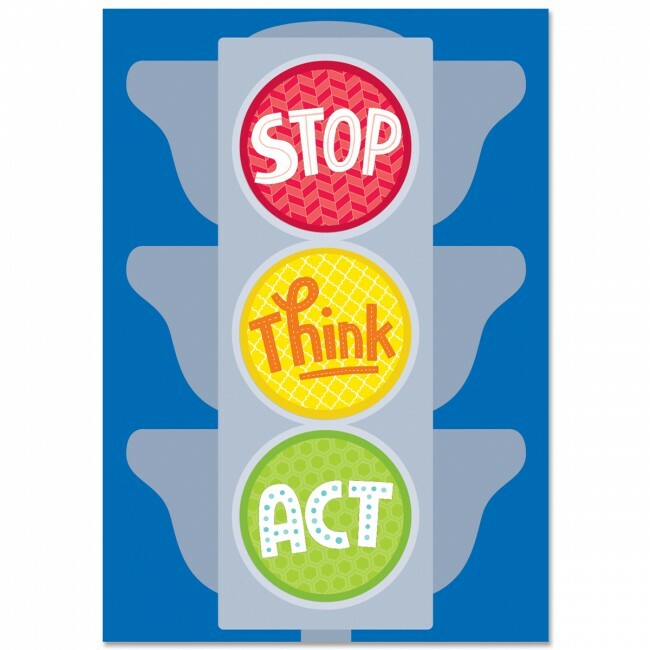 Not only is refusal —or “opting out”— of standardized testing justified, it is necessary. Here’s why: the “reform” process of No Child Left Behind failed and the system failed to respond, or even acknowledge, the crux of the problem despite the repeated attempts of many to help make the law better. Many parents in low-income communities endured the senseless, useless, time-consuming, curriculum-narrowing, opportunity-limiting implementation of the No Child Left Behind standardized testing regime. Quietly? No, not all of them. Many wrote letters to representatives, editorials to newspapers, dozens upon dozens of researched papers, and even books! The “silver bullet” of standards and testing tied to “accountability” was sold to the public as the path to school improvement. No proof then; no proof now. Familiar words? Same promise? Different year – 2011. Not paying attention, or, has the information been very tightly controlled? QUESTION: how do these laws and codes supersede the civil rights of parents as guaranteed by the Due Process Clause of the Fourteenth Amendment of the Constitution of the United States? Also in the letter was an expression of consideration, “I fully understand every parent’s desire to make educational decisions they think are best for their child…” But… the tone of the letter was meant to discourage parents from doing what they felt was best. How can there be “full understanding”? FURTHER QUESTIONS: How do parents decide what is right without a full disclosure of information? Are our data exchange projects with other states still ongoing? With student data being linked with information from agencies outside the State Department of Education, will parents or guardians be given the chance to give consent to each transfer of their student’s data? In informed decision making on this matter, all facts are required to decide if the decision to refuse this testing will severely impact the quality of education in the district, as stated in the letter. Does the risk outweigh the impact of lost instructional time, lost instructional dollars, and loss of control of curriculum content as well as private student information? There is a reason the dissenters to high-stakes testing have not been sufficiently heard. Bill & Melinda Gates Foundations are major sponsors and this piece was essential for the Common Core State Standards Initiative package deal. With the push for development of longitudinal data systems during the pit of the Great Recession, many issues surrounding the Common Core State Standards Initiative and its “next generation” tests were not fully vetted in the arena of public opinion partially because it became a “best practice” to “not engage in large scale, open forums.” The not-to-be open debate on education reform could have benefited the public’s understanding of No Child Left Behind, the Common Core State Standards Initiative and its “next generation” assessments. 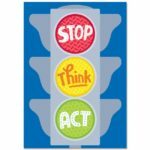 1) No Child Left Behind is the federal law upon which the nation was convinced they must comply with high-stakes standardized testing. Thirteen years later, that nonsensical overstep by the federal government has yet to be challenged in our superior courts. Disregarding research about appropriate uses of standardized tests and with no regard for objections raised by the people affected by the law, the law remains in place and the reauthorization process is far from transparent. Consent by the People has not been deemed to be of importance therefore leaving civil disobedience as the next step in a parent’s duty to defend what they think is best for their children. 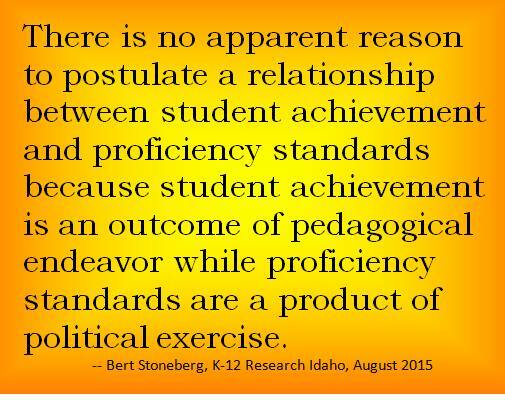 2) The Common Core State Standards Initiative was never about “just” the standards. There was always the intent to develop the “next generation assessments” to correspond with the Common Core Standards. Our American Reinvestment and Recovery Act (ARRA/TARP) dollars served as the seed money for the two consortiums to develop these tests. What has always been missing from any public discussion was the intent of the two private, non-profit groups that hold the copyright for the standards — the Council of Chief State School Officers (CCSSO) and the National Governors Association (NGA). 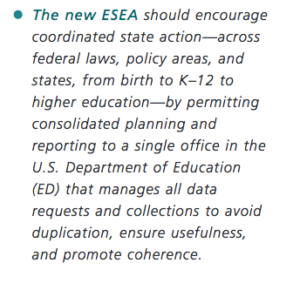 The intention was/is to “direct the collection of student data to a single reporting office within the U.S. Department of Education through the reauthorization of ESEA” (the Elementary and Secondary Education Act) otherwise know as No Child Left Behind. 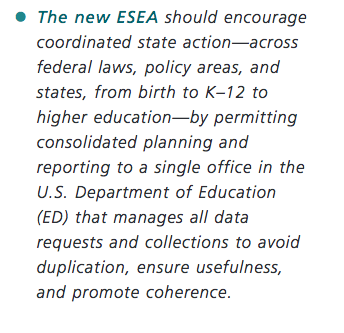 This is item #10, on page 9, of the CCSSO/NGA “new deal” for ESEA reauthorization. 3) What should be respected and understood about a parents’ refusal to comply with the rules, regulations, and laws set down for them by their elected representatives, who have not represented their views, is that they feel a strong moral responsibility to do what is right for their children. Many parents feel forced or coerced participation in testing is wrong, and is potentially, and in reality, driving a wedge between them and their child, their teachers, their school administrators, their neighbors, communities, and the larger society who can’t comprehend or understand their stance. What we should understand as citizens is that it is morally reprehensible to turn a blind eye to rules, policies, and laws judged to be wrong for children by their own parents. 4) As ordinary law-abiding, tax-paying citizens, we pay our taxes because we know it is the cost of maintaining a civil society including “free” public schools. In a representative form of government founded on the Consent of the People, our choices in this manner should include having “large-scale, open forums” where a meaningful exchange of ideas could occur, or, civil disobedience as a second choice when the first choice has been denied us. With No Child Left Behind testing mandates, the Common Core State Standards Initiative, and their “next generation” tests and all that go with them, the choice was made for us. Our “consent” in the decision-making process was denied. Civil disobedience through test refusal is a parental right in need of supporting. Politicians put parents and children in the middle of the mess they created through a corrupted political process. There was always a better way.